The Virgin Galactic project is still on track, with Sir Richard Branson unveiling SpaceShipTwo – which will allow people to visit space for £121,500 a pop. The Rutan built ship is the successor to the SpaceShipOne which won the X prize by becoming the first private manned spaceship to reach space. Branson and his family will be the first space tourists on the Virgin Galactic ship, but it is reported that 300 people have already paid up the $200,000 (£121k) fee or at the very least a deposit to book a place on subsequent flights. "I have been dreaming about it ever since the Moon landing - that one day I would get the chance to go into space, said Branson from the Mojave desert launch site. "Nasa, I suppose, didn't think that you or me would like to go into space. So a number of years ago I thought 'Screw it , let's do it, let's build our own spacecraft'." 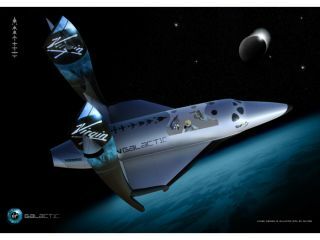 The first flight is scheduled for early 2011, with the first six passengers – and two pilots – potentially representing a new generation of space tourists.